DETAILS: Spoil the brew lovers AND wine enthusiasts in your life with this classic personalized multi-tool. This wood handled personalized bottle opener has four convenient functions. 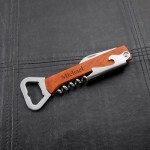 It contains a bottle opener on body and fold out corkscrew, bottle opener and knife. A perfect addition to the home bar, picnic basket or keep in the trunk for tailgating parties! The stained wooden handle is customized with your choice of personalization up to 15 characters. 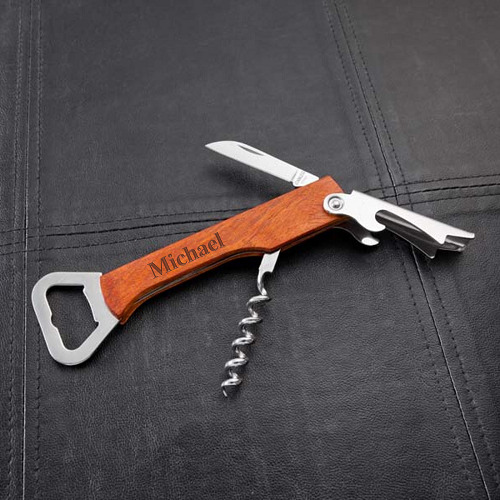 With its classic feel and unique function this keepsake will get plenty of use for years to come.